The web server with the IP-address 192.64.147.166 used by Chicagomarket.net is owned by Voodoo.com and is located in Tampa, USA. 79 other websites are located on this web server. Most of them are provided in the english language. Some websites on this web server are not suitable for minors. 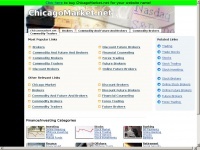 Because Chicagomarket.net was not classified as a website for adults, the proximity to other adult websites could impact the classifcation of this website negatively.